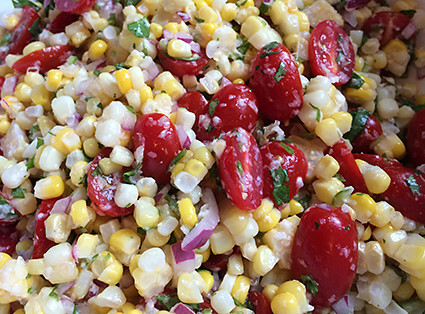 This summer my friend Veronica made a delicious corn salad one evening for a family bbq, and I’ve been riffing off of it ever since. First, I juice the limes and chop the red onion, and macerate the onion in the lime juice while working on the rest of the salad. You want a fair amount of lime juice so if your limes are dry, use more of them. For the corn, if you have the ability to cook them over a grill, blackening them in their husks, that is preferred. However, if that isn’t possible, you can also husk them and boil them for 5 minutes. Cut the kernels off the cob and put in your bowl. Halve the tomatoes, chop the cilantro, mince the hot pepper (if fresh peppers are hard to come by, use hot red pepper flakes), and stir it all into the bowl, adding the lime and red onion. Add a pinch of salt and grate manchego cheese on top to taste. Stir about a half cup of grated manchego in, and keep on going until you have the taste you like. Personally, I think this salad is nice at room temperature or even a bit chilled, so will often cover with wrap and put in the fridge until 30 minutes before serving.